Our good buddy Louie Contreras of L-CON fabrication is having the grand opening of his new very unusual shop, The FlagShip. The FlagShip combines Louie’s awesome motorsports fab shop with Rogue Status and other clothing, Suicide Machines custom bikes and other eclectic stuff. It’s sorta hard to explain so you just have to check it out. 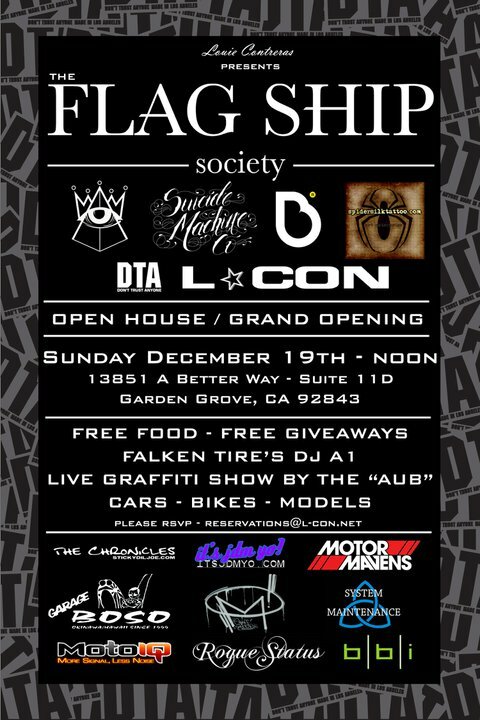 Be there Sunday December 19 from noon onward and hang out with us. Prepare to be amazed if you are into race cars, hot street cars and bikes.